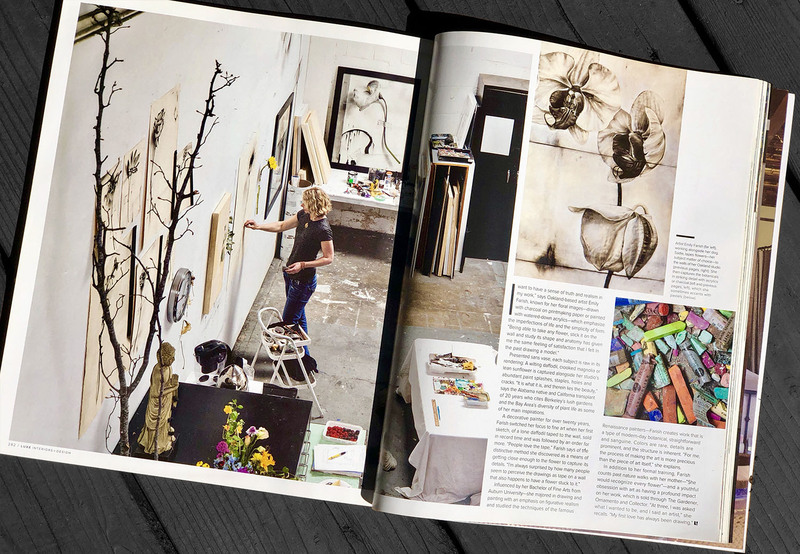 To find out more about Emily Farish and her studio, click here to read the full article in Luxe Magazine. Emily Farish is an artist in Oakland, California who specializes in large-scale botanical drawings. Her work can be found in selected galleries and fine retailers, and she works steadily with designers around the country on commercial and residential art placement projects. Each of Emily’s drawings begins with the concept of wabi-sabi, which is the Japanese philosophy most commonly described as“the beauty of things imperfect and impermanent”. Emily records not only the vines and flowers she gathers on hikes through out the Bay Area, she also carefully renders the tape, staples, and scratch marks found on her studio wall.